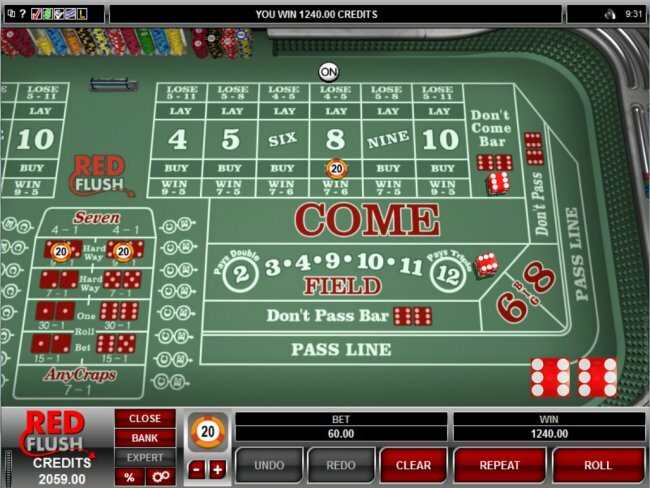 Craps is a favorite casino game for many players. It is fast, exciting and can even get a little wild at times. It appears to be complicated at first but it actuality is very simple. On the first roll (the come out roll), the shooter is trying to establish a point with one of the following numbers: 4, 5, 6, 8, 9, or 10. If the shooter rolls a 7 or 11 the wager is paid off at even money. If the shooter rolls a 2, 3, or 12 then the wager is lost. If the shooter rolls a point number, then it progresses to the next stage where the shooter has to roll the same number again before rolling a 7. Check out this online casino guide for some great places to play craps. There are several types of bets which can be placed on a craps table. This is the opposite of the Pass Bet. This bet is placed against the shooter and wins if craps (2, 3 or 12) is thrown on the come out roll or if the shooter fails to make the point. If a 12 is thrown, the bet ties. This bet is similar to the Don't Pass Bet, but need not be made on the come out roll. This is an additional bet made on a Pass, Don't Pass, Come or Don't Come bet that has already been placed. Odds bets can only be made once the point has been established. The advantage of an odds bet is that it is paid out at the correct odds. This bet can be made on the following numbers: 4, 5, 6, 8, 9, 10. It is a bet that the relevant number will be thrown before a 7. This bet can be made on the following numbers: 4, 5, 6, 8, 9, 10. It is a bet that a seven will be thrown before the relevant number. This is a bet on the outcome of the next throw. It pays even money if a 3, 4, 9, 10 or 11 is thrown and 2-1 if a 2 or 12 is thrown. This bet can be made on 4, 6, 8 or 10. It is a bet that the relevant number will be thrown in its double form before a 7 and before that number is thrown in any other combination. Any Seven: pays 5 for 1 (4 to 1) if a 7 is made in the next throw. Any Craps: pays 8 for 1 (4 to 1) if a 2, 3 or 12 is made in the next throw. Craps Two: pays 30 to 1 if a 2 is made in the next throw. Craps Twelve: pays 30 to 1 if a 12 is made in the next throw. Craps Three: pays 15 to 1 if a 3 is made in the next throw. Eleven: pays 15 to 1 if an 11 is made in the next throw. Find your chances of winning with house edge and payout odds for each bet. Learn which bets carry the highest advantage for the house, and which are best for players in craps odds.